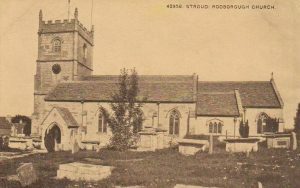 A Stroud Journal article of 1910 notes that the church dates from 1392, being a Chapel of Ease to The Priory Church at Minchinhampton until 1840, when Rodborough became a parish in its own right. The tower is thought to have been rebuilt in 1580. 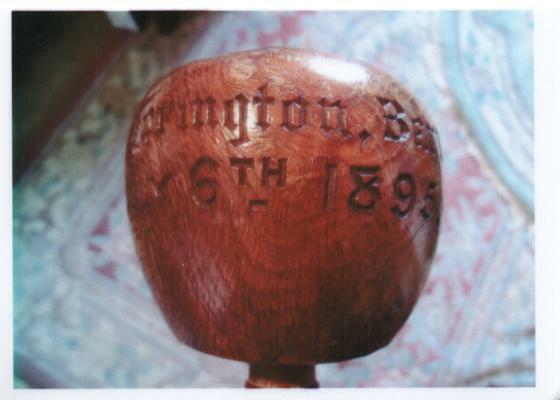 The one remaining bell is assumed to be of the same age. From Rev Miller’s 1933 ‘Rodborough and its Church’; originally four bells hung in the tower, but during the Civil War three were lost. It seems probable that either the Royalists or Roundheads dismantled them, melted them down and used the metal for military purposes. The fourth bell still remains. It weighs 25 cwt and bears this inscription: “The living I to Church do call, And to the grave do summon all”. 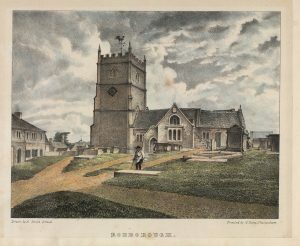 The 1889 edition of “Twenty Lithographic views of ecclesiastical Edifices In the Borough of Stroud” suggests that apart from the early 16th century tower, the entire church was rebuilt in 1842. Here is an undated 20th century photo for comparison.